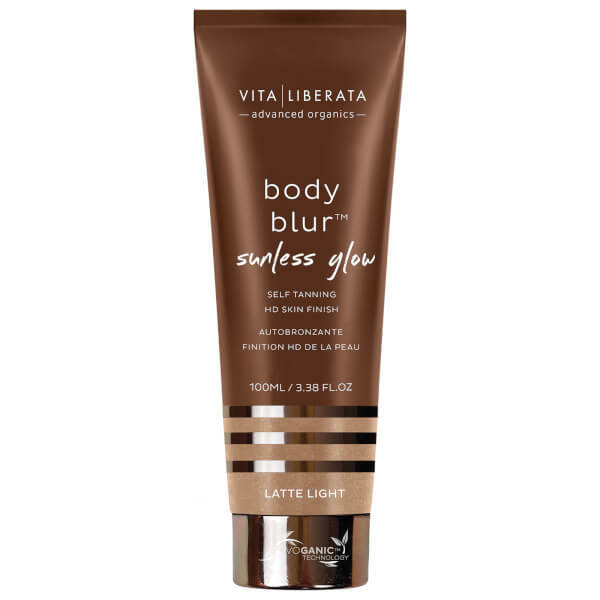 Create the appearance of flawless skin with Vita Liberata Body Blur Sunless Glow HD Skin Finish, an instant body makeup that lends skin a smooth, flawless-looking finish. Formulated with Body Blur™ technology to minimise the look of imperfections, including blemishes and cellulite, the silky lotion glides effortlessly onto skin, delivering a natural-looking tint that enhances your skin tone and leaves the body looking glowing, radiant and photo-ready. Caring for skin, it utilises Advoganic™ technology, which supercharges the formula's certified organic extracts for intense hydration. Infused with natural extracts and organic tanning actives to prolong your glow for up to seven days. Choose your perfect shade of body blur skin finish based on the normal colour of your skin. Ensure skin is clean and exfoliated. Always use a tan mitt and with a grape sized amount, apply with circular movements. Use sparingly on hands, feet, knees, and elbows. Do not moisturise or use moisturising shower gel prior to application. To ensure transfer resistance pat your skin with a tissue so that any excess is removed prior to getting dressed. Aloe Barbadensis Leaf Juice*, Glycerin*, Dihydroxyacetone***, Cetearyl Alcohol, Heptyl Undecylenate, Cetyl Alcohol, Glyceryl Stearate, Isohexadecane, Panthenol, Ethylhexyl salicylate, Butyrospermum Parkii (Shea) Butter*, Tocopheryl Acetate, Hyaluronic Acid, Sodium Benzoate, Potassium Sorbate, Synthetic Fluorophlogopite, Homosalate, Hydrolysed Silk, Tin Oxide, Titanium Dioxide (CI 77891), Iron Oxides (CI 77491, CI 77492, CI 77499), Red 33 (CI 17200), Yellow 5 (CI 19140), Blue 1 (CI 42090). *Organic, ***Ecocert.